Teacher's Take-Out: Pirate Resources and a Freebie! Pirate Resources and a Freebie! AARRGHH Matey! 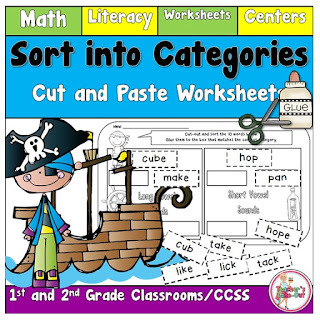 Sort into Categories using Literacy and Math Cut and Paste Worksheets has a Pirate theme. These worksheets are perfect for 1st and 2nd Grade Classrooms. 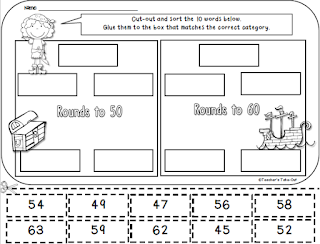 There are 51 worksheets that include math or literacy skills. Students cut–out the 10 tabs at the bottom of the worksheet. They sort the 10 tabs into 2 or 3 categories and glue them onto the empty boxes according to the category. 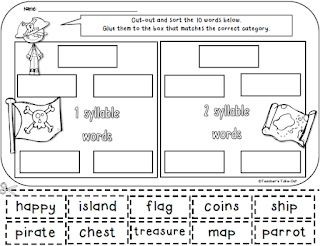 Free Trial Cut and Paste Worksheets. Give it a try!